Aizawl, Apr 26 : Mumbai International Film Festival gets underway here in Aizawl from today as the Parliamentary Secretary to Chief Minister Lal Thanzara inaugurated the event at I&PR Auditorium today. 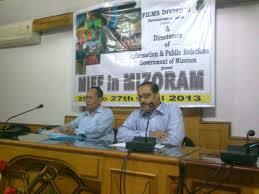 Film Division, government of India and Directorate of Information & Public Relations, government of Mizoram are organizing the three-day non-competitive Documentary, Short and Animation Film Festival in Mizoram which will conclude on April 27 . Jim K.Chozah, Director, I & PR and Sumay Mukherjee, Film Division, Ministry of I & B, Government of India are also participating in the event. During the festival, award winning films of Mumbai International Film Festival for Documentary, Short & Animation Films (MIFF) will be screened, along with a Mizo feature film. MIFF in Mizoram is a festival of award winning films from the Mumbai International Film Festival for documentary short and animation, which is held biennially at the financial capital of India. The MIFF, which began its journey in 1990 as Bombay International Film Festival (BIFF) has since grown in size and stature as one of the premier international events of documentary film movement. The past editions have been overwhelming successes, and now MIFF is considered as one of the most spectacularly organized international festivals in the world. It is reckoned on par with prestigious international film festivals like Leipsig, Berlin, Oberhausen, Cracow, and Tampere, etc. However, MIFF has an edge over other festivals as it gives away the maximum cash awards-a total worth approximately Rs.6.35 million, besides mementos such a golden and silver conches for outstanding films. On an average more than 35-40 countries participate in every edition of the festival, which serves as a platform for documentary film makers to meet, interact and exchange ideas. The festival attracts the best of films made all over the world on varied subjects. Many internationally renowned filmmakers like Gagisa Oshima, Werner Kobe, Krzysztof Zanussi, Peter Wintonik etc. have participated in the festival as jury/ participants in the past. Apart from micro animation & lengthy documentaries, MIFF boasts of a bouquet of acclaimed films curated and sourced from India and abroad in special packages and retrospectives. MIFF in Mizoram has been showcasing in this event, some of the finest cinematic works realized in the last eight years throughout the world. "Little Terrorist" directed by Ashvin Kumar, which was also nominated for the 2005 Oscar Awards for Live Action Short Film, was screened as the opening film. The festival will culminate by screening the Mizo feature film "Zodinpuii" directed by Lalzidinga. Addressing the Film Festival today, Lal Thanzara said that even as film making and production is not a new thing for the Mizos, given that for some years like in 2004 mizo films even began widespread, but due to lack of efficiency in film-acting, editing and other technicalities, the Mizo film industry still lagged behind. As faced by other places in the world, piracy and violation of copyrights are the hindrance in the progress of filmmaking in Mizoram, Lal Thanzara said. Parliamentary Secretary mentioned that Mizoram government since last fiscal allocates 10 lakhs for promotion of filmmaking in response to the need of the younger generations. He expressed his expectation that the seeting up of IIMC Centre in Aizawl, Mass Communication cources in MZU would enhance immense development in filmmaking and production. Saying that television programmes these days are not mere entertainment but educational and informative, Parliamentary Secretary expressed his hope that the pictures to be showcased in the Film Festival would be instructive and helpful. The inauguration of Film Festival today was conducted by I&PR Director Jim K.Chozah, while Film Division of India, Kolkata Branch Manager Sumay Mukherjee delivered the foundation of the event. During the 3-day festival to be held between 1 pm - 3 pm everyday at I&PR Auditorium. Documentaries and Animated films will be presented for all interested visitors. The film 'Little Terrorist 'was shown today. On the last day of the popular Mizo film 'Zodinpuii' will be presented. Central Government Film Divsion organises Mumbai International Film Festival after every two years in diffetent states, and the event being held in Aizawl is the fisrt time in Mizoram.